Recently, the Wall Street Journal revealed something most parkgoers hoped was an unfounded rumor and countless cast members already knew to be true: When it comes to the ceremonial scattering of cremated ashes, a lot of people pick the Disney Parks as their loved ones’ final resting place. The answer to the question you’re asking right now is yes, this practice is definitely illegal and no, Disney doesn’t condone the behavior, no matter how touching a story accompanies it. In fact, the Wall Street Journal even goes on to add that guests caught scattering ashes in the parks will be escorted off-property, where harsher ramifications may await rule-breakers. While it’s understandable that Disney would refuse requests to dump ashes in their attractions (or parade routes, grassy lawns, lagoons and rivers, you name it), few alternatives are presented to guests looking to honor their dearly departed. Custom commemorative bricks and pavers were discontinued at the Magic Kingdom and Disneyland around 2007 and 2011, respectively, and unless your relative or close friend happened to be a bonafide Disney Legend, chances are you won’t see their name etched onto a Main Street, U.S.A. window anytime soon. That doesn’t mean, however, that there aren’t poignant and meaningful ways to celebrate a loved one’s memory at the Disney Parks. Here are just a few ideas to make your next trip special… without doing anything that’ll get you permanently banned from the parks. 1. Ride their favorite attraction. One of the simplest ways to honor the passing of a loved one is to make a tradition out of doing their favorite things at the Disney Parks. Perhaps they loved the dips and twists of Space Mountain or found the gentle rocking of “it’s a small world” soothing. Maybe they always rode Splash Mountain first thing in the morning and pulled a funny face during the ride photo, or loved to sing along during the Country Bear Jamboree on rainy afternoons. If there’s no one favorite attraction or show that springs to mind, consider finding a quiet spot in front of the castle or in the Hub and having a moment of silence to remember the happy times you spent with them. Whether you make an entire day out of doing everything they loved to do at the parks, or whether you simply reflect on your happy times together during one of their favorite attractions, make it unique to your relationship with them. 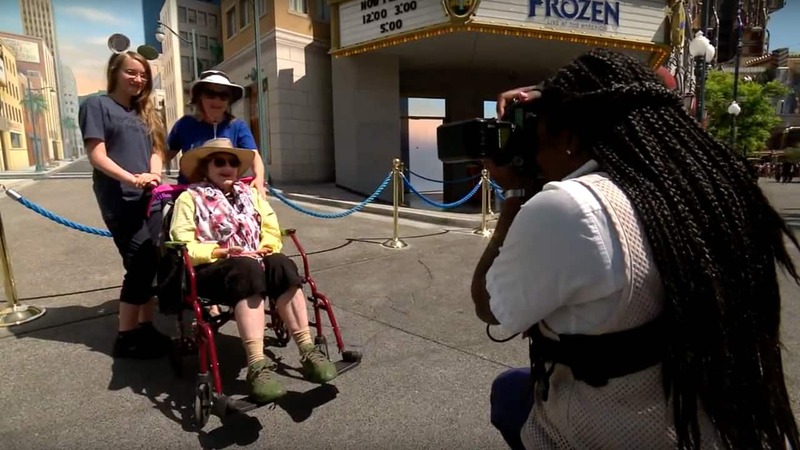 The most important thing is that it brings healing to you, and building a lasting association with a favorite attraction and a cherished memory of someone you love can be a beautiful way to facilitate that process. 2. Re-photograph a favorite photo. Maybe going to Disneyland was an annual family tradition or the weekend spot you always met your friend to chow down on churros and catch a late-night showing of Fantasmic!, or maybe visiting the Magic Kingdom was a lifetime bucket list goal they never got to fulfill. If riding their favorite attraction isn’t something you have the time or desire to do—alternatively, if they preferred perusing the Food & Wine Festival or visiting character meet-and-greets to riding roller coasters—consider bringing along a favorite photo and asking a PhotoPass photographer to snap a picture of you holding it. If that doesn’t appeal to you, you can also create a keepsake by framing the old and new photos side by side, bring the original photo to a character interaction with their favorite Disney princess or fur character, or try to recreate the original backdrop and pose as an act of remembrance.